GB: First of all, how is Hordes of the Underdark coming along? Are you still on track for a late November release date? Darcy: Hordes is coming along great. It's a lot of fun creating this expansion pack. With all the new features we are jamming into it, it will be fun for the community as well. Tom: The team right now is working hard to hit our target release date. The game's fully playable, and it's tons of fun. I think the campaign is superior to anything we've done in Neverwinter so far. The designers have done an amazing job with it. GB: For those players unfamiliar with epic levels, can you explain how they work and what benefits they will provide for existing characters? Darcy: In the 3rd-edition D&D rules, epic refers to levels higher than the normal 20 players can achieve in the core rule books. It means that players can keep growing their character to become more and more powerful. 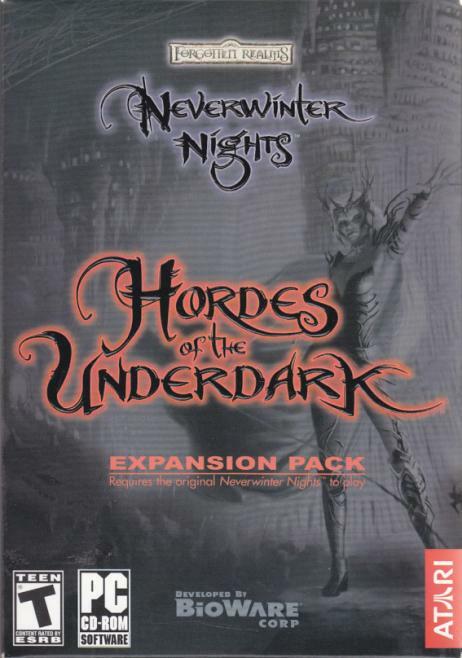 In Hordes of the Underdark, we have added many new feats and spells for all classes that achieve greater than 20th level. GB: How many new magic items are you implementing into HotU? Care to detail any of the more powerful ones? Darcy: There are quite a few new magic items we are integrating into Hordes of the Underdark. We're upgrading all the current weapons and items to have attack bonuses ranging from +5 to +20, and adding a Djinni Bottle which contains a store so the player can buy and sell items as long as he has the bottle and gives it a rub once in a while. We are also adding an intelligent weapon the player can find. This black blade gives the player great attack bonuses, and it has a terrifically sour disposition. I guess I would too after being stuck in the hands of a skeleton for centuries. GB: Other than new tilesets, items and creatures, are there any extra NWN Toolset additions or features, such as new wizards, handy scripts, perhaps a higher resolution? Darcy: There will be several new toolset features. We have added a new Area property that allows you to set the fog distance. This will give module creators more options in creating the look of areas, and it takes advantage of the new unlocked camera in HotU. In terms of new graphics, it is possible now to attach wings and/or tails to creatures if they use certain appearances, including all the playable race appearances. In addition, we have added a Hak Pak sync feature. It will list all the features of Hak Paks and show those that are duplicated, have the highest priority, and which ones override game resources. There's really quite a bit of new stuff for the awesome custom-content community that exists for Neverwinter. GB: With the new D&D 3.5 ruleset in full force, are you finding it difficult to stick with the 3rd edition ruleset in any way? Have you considered blending the two? Darcy: We are perfectly happy with the 3.0 ruleset right now. They have allowed us to create some fun and exciting features and adventures, and have no plans to blend the two.